BlytheLife.com » Interview with Melly Kay and a Blythe Giveaway! People who customize are pretty much fantastic to me, seeing as I’m not exactly customizing-inclined and I love looking at photos of customized Blythes. Customizations by Melly Kay is no exception! She has a wonderful eye for colour, combines her style with everyone’s favourite doll’s style. You can check out Melly Kay’s website and Flickr photostream to see all there is that she offers, and it’s all wonderful. Hi Melly Kay! What can you tell us about yourself? Who was the first Blythe that you customized and what did you learn from the experience? The first Blythe that I customized was an ADG Pleasant Peasant who I named Gaga. I bought her on ebay and I decided to learn to customize on her. I remember being so excited but also very nervous because I’d read about how hard ADGs are to open. But I got my girl open and did all the common customizations on her one by one. I learned so much while customizing her! Obviously I learned about doll parts and customizing tools/methods, but I think the main thing I gained from it was confidence. I went into this not know how to do any of it and being very nervous about messing the doll up. After I was done and she turned out so cute, it made me realize that maybe this is something I should pursue! There are so many different Blythe molds and not all of them open up the same way, which ones do you like working with the best and why? I like the RBL mold (especially the translucent girls!) mainly because I’ve worked on them more than any other mold. For me, they’re easy to open and I love their stock look & expression. But I look forward to working with the other molds too. I’m dying to do my first EBL! If you could describe your customizing style in 140 characters or less, how would you describe it? Playful, sweet, colorful, kawaii, whimsical, intricate & just fun! My style is basically a fusion of all the things I love & am inspired by! I get nervous just thinking about opening up a doll’s head, what is something that you find challenging about customizing and how do you overcome this challenge? My biggest challenge with customizing is battling nerves! I am a worrier by nature anyway, so the fear of screwing up someones doll can get intense. (I usually get so nervous when the doll arrives that I leave her in the box for a day or two and avoid her at all costs, haha!) I try to overcome the fear by being confident in my ability. I know that I can do the work and I have never had any major accidents, so I remind myself of that and press on. Once I sit down and start the custom, I usually feel a lot better too! Also, I try to play music while I’m customizing too. Music is a big part of my life and it really helps me mellow out and stay focused. For those who have never gotten a doll customized before, what are some things that you would tell them to look for in a customizer? Hmm, I would say first and foremost, educate yourself about Blythe customs and know a little bit before diving in. It helps to know terminology and stuff like that. Then I would look at the customizer’s style and abilities. There are so many great customizers out there with different artistic styles so be sure to find one that is customizing Blythe in the way that appeals to you. Also, be sure to check out their portfolio so you can see the quality of their work. I recommend asking lots of questions and getting to know your potential customizer too. You should look for someone who explains everything to you and helps you understand the process. I know each and every customizer works a little differently, what can you tell us about the process from initially talking to you to finally receiving a Blythe back in the mail from you? Initially, we’ll go over services and pricing. I like to make sure the client understands what they will get and how much it will cost. Then we discuss color palettes and potential themes. I like for the client to give me as much input as possible about colors they like/don’t like and that sort of thing. I keep a notebook of every client and their requests for their doll so that when the doll arrives I know exactly what to do and I don’t get disorganized. Once the client is sure they want a custom from me, I request they send the doll and payment. When the doll arrives, she gets her own sealed bin and I keep all of her parts, screws, t-bar, clothing, etc. in this bin so that her belongings don’t get lost or sent home with the wrong doll. When I begin working on the doll, I like to try and get the face-up done first and get approval on the colors and then usually I’ll go back and do touch-ups and add little details. I take pictures and send messages throughout the entire process so the client knows exactly what’s going on with their doll. Once the doll is finished, I box her back up and she’s on her way home! I always ship via USPS with tracking & insurance. I also offer FREE touch-ups on minor damage (rubs, fine scratches, etc)…all the client pays is shipping. 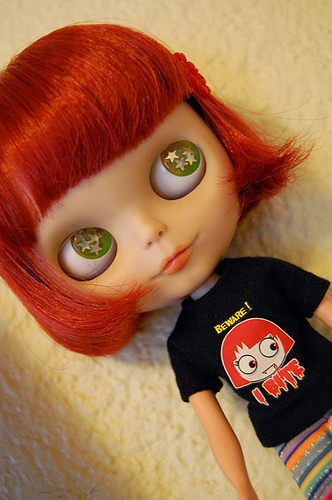 What’s your favourite thing about customizing Blythe and why? What comes to mind when you see people enjoying the customs that you have done? Just pure happiness comes to mind! Whether it’s people leaving wonderful comments about my customs on Flickr or seeing pictures of my custom girls in their new homes, it just makes me smile really big. These girls are SO special to me and for another person to feel the same way about them is just amazing to me…I’m still in awe about it at times! Like any artist, customizers draw their inspiration from somewhere. Where do you get your inspiration from for your customs? I think the main thing that inspires me is Blythe herself! From the hair colors to the eye chips to the clothing, it all makes me feel creative! I get inspired by lots of things though…beautiful colors, textures, music, characters from my favorite movies/tv shows, nature, and most definitely other customizers! My favorite customizer is frankie.DARLING and I love browsing her Flickr photostream and looking at all of her beautiful girls. I think her customizing style is so unique and the way she photographs her girls really makes her work pop! When I look at her customs, I see HER if that makes sense. Who she is shines through and I really aspire for people to see ME when they see my girls! Thank you so much for doing this interview with me, Melly. Just one last question, what kind of advice do you have to give to someone who’s new to the Blythe hobby? You’re so welcome and thank you for having me! As far as advice, first I would say learn as much as you can. I spent a lot of time researching the first few months and it helped me understand things so much better. I’d also say reach out and join a forum or get on Flickr and connect with all the Blythe lovers there.The Blythe community is wonderful and there are so many amazing people from around the globe that connect with. I’d also say go into i with a budget and plan of some sort. Blythe is addictive and expensive so prepare yourself for that. Don’t be impulsive like me, lol! Every single time I buy a girl I like on impulse, it never fails that a “dream girl” I really want goes up for adoption a few days after and I don’t have the funds to get her. Take your time, plan your collection out and have fun!! 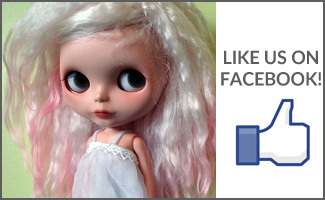 Melly Kay is giving away a customized Blythe, meet Miss Bellatrix Gamma Ray! Melly Kay customized this lovely Bohemian Peace and this is Bellatrix Gamma Ray! You can check out her Flickr set and totally fall in love with her. You can get up to three entries for this giveaway draw and you can enter until Saturday November 13th at 11:59pm PST. The draw will be held on Sunday November 14th and the winner will be announced on BlytheLife.com. Remember to use a valid email address for all comments. If you win, your email will be forwarded to Melly Kay for arranging shipment of the prize. Entry #1: It’s short and simply this week: what’s your favourite thing about Blythe? Entry #2: Tweet about the contest! Please include the url to your tweet or your Twitter username. Entry #3: Blog about the contest! Please include the link to this page. What a nice read and such pretty, colorful girls! My favorite thing about Blythe is I’ve never met a custom girl I didn’t like :). the interview was wonderful! i really love how dreamy and colorful melly kay’s girls are! my favorite thing about blythe besides the dolls themselves is the community and how creative everyone is.. it really makes my day to see all the wonderful photographs everyone takes of blythe dolls. I ADORE Melly Kay customs! Yay!! I’ve sold a Blythe or two to “Melly Kay” and I have been amazed at the way they turned out. She is an awesome artist. My favorite thing about Blythe is the variety of people who love and collect her. She knows no age barrier and is loved by people of many nations. Your work is awesome, and I’m totally in love with your new custom girl Bellatrix, I want her so bad!!!!!! 🙂 Hope I can get a small chance to win her! Oooh! What a wonderful custom! My favourite thing about Blythe is her versatility… she can be cute and kawaii, punk or dark – so many different looks from one amazing doll! I look forward to these interviews! This was another fabulous one! I love the movie quotes about staying in touch with childhood! My favorite thing about blythe….She lets me be creative in short bursts and as a working mom…I only have short bursts to be creative! My favorite thing about Blythe are all the friends I have met because of her and how she has inspired me to learn how to do many things like sewing and photography! Melly Kay’s work is incredible! Best lips around in my opinion! Many of us appreciate that John in Carolina cnotinues to monitor the Duke lacrosse case. Thanks for the link to Johnsville. This could turn out to be a groundbreaking legal event, testing the libel laws, the limits of possible prosecutorial abuse, the competence of the police investigators, the complicity of the city of Durham, etc. Does anyone think a libel suit will be brought soon on behalf of the unindicted lacrosse players in the infamous vigilante poster? Isn’t that a slam-dunk case? Here is the link to my Twitter! And now that I’ve done my 3 (fingers crossed entries) ~ Wonderful interview. Melly Kay is amazing and I’m so excited she’s becoming such a light in the dolly community. My favourite thing about Blythe is the fact that she is so expressive. More expressive, I think, than other dolls. I think it likely has to do with her unique eyes. 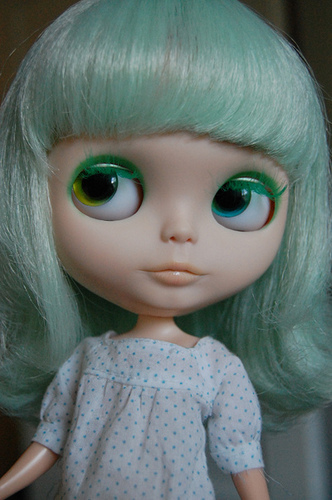 My favorite thing about Blythe are those great big beautiful eyes. What a wonderful interview. I stumbled upon Melly Kay’s Flickr photostream recently and have been a big fan ever since! Her girls have a polished , sweet look about them. My favorite thing about Blythe, is that I can be creative with them and dress them up. I wasn’t really into dolls when I was little and now I am. It’s been a great bonding experience between my daughter and I. 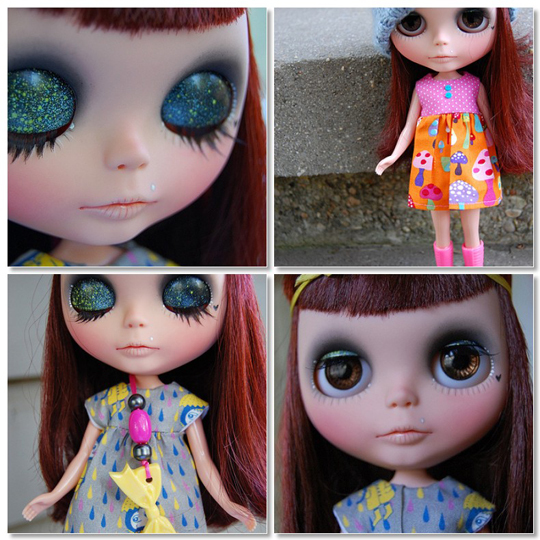 My favorite thing about Blythe is how each one is different and they can be customized so many ways! I forgot I had a Blythe blog but found it and blogged this! Thanks so much for hosting this giveaway! What an awesome giveaway! My favorite thing about Blythe is the incredible community of creative people I have met through her! i put this on my twitter ! I LOVE MK’s customs! I’m on the list to send a doll to her in a few months, yay! What I love about Blythe is the unique personality of each doll, even two stock dolls that are exactly the same. The owner of each doll really shines through. And I love the community…everyone is so fun, and nice! My favorite thing about Blythe is a time for myself, for fun, meeting friends and creativity!!! I’m lucky to have 3 girls customized by MK, she’s AWESOME!!!!! I’m totally in love with the girls!!! The thing I love best about Blythe is the childlike charm she exudes! I love their sweet faces and how each one has her own personality. I also love the fun clothes and hair. I likely won’t colour my own hair pink or blue, but who says my Blythe can’t? And finally, I blogged about the giveaway. What a super fantastic giveaway! 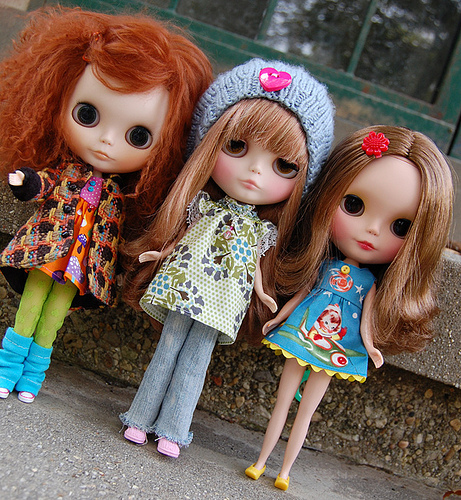 I love the adorable little faces of each Blythe. My favorite thing about Blythes is that I think they are just plain cute, not creepy. My Most favorite thing about Blythe, her Big Eye’s, Massive Head and the ability she has to either draw you in or creep you out. Either way, no one can ignore her! I love you Blythe. What a great competition and opportunity to win one of Melly’s beautiful Blythes ! The thing I love about Blythe is that aside from the appeal of the dolls themselves the hobby doesn’t merely involve buying dolls and displaying them like any other collectable. 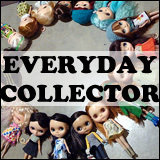 Being a Blythe collector encourages all kinds of creativity – photography, sewing, designing and customising as well as welcoming you into an active community of like-minded people. My favourite thing about Blythe is the ability to customize the dolls, that way they become truly and uniquely yours. My favorite thing about Blythe is that I never grew out of loving toys, children’s books, and other cute things, and I felt like everyone else on the planet except me got a memo on how to be an adult. When I found Blythe by accident on a blog and was introduced to flickr and blythe forums I was so excited to know that there was a HUGE group of people out there just like me!! It is great to not feel so alone! I love how Blythe brings together this population of artists, crafters, and kind hearted, fun people. You can see different aspects of each person’s personality in their dollies and people make connections when they really love someone else’s style. <3 Thanks for the interview!! It was great. Aww, this is so nice. I love all of Melly’s girls. I have been following her customs since she started. My favorite thing about Blythe is the other activities that Blythe leads too. People who Blythe are also artists (customizers), sewers, knitters, photographers; the creativity in the Blythe community is amazing. What do I love about Blythe? I love the fact that teens/adults can have a doll all their own. The dolls are adorable, stylish and make you feel like you’re a kid again. They have their own unique look to them and they all look so different. They’re beautiful! 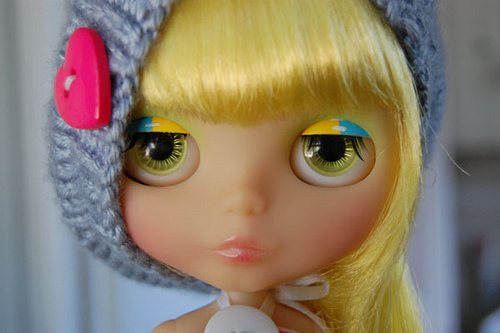 My favorite thing about Blythe is their BIG BIG beautiful eyes and the personalities that come out of it!!!!! I love Blythe!!! My fav things are about blythes is…gosh I have to choose one? I’ll go with their changeable eyes! Go melly kay, your one talented lady! This was a great article. Such beautiful girls. My favorite thing about Blythe is being able to make my girl my own and unique. They each have their own personality. No girl is the same. My favorite thing about Blythe is that it has given me a happiness and joy that I never experienced as a child. I discovered Blythe this spring at the age of 46. I had an unhappy childhood but grew up fulfilling my dream of first becoming a flight attendant (18 years) and now a police officer (6 years). I had several tries but have finally met and married the man of my dreams. The only thing missing was that there was always a sadness that I felt deep inside. I filled that sadness with too much work, too much exercise, doing for others and not myself. With my husband’s encouragement to find a passion and find something that gives me joy, I discovered Blythe in the spring. My first impression of her was that she looked “weird”! That was the stock Blythe. When I discovered flickr and that Blythe could be customized…I became a different person! Blythe and the Blythe community has given me so much. I do feel like every person that owns a Blythe has their own story to tell about their relationship with her. I have never really had any girlfriends but I now have amazing people I chat with every day! The Blythe community is caring, generous and kind. Melly Kay is someone I came across while on flickr. I absolutely love her work and especially her sweet girl Pickles. My first comment to Melly was answered almost immediately and was kind and sweet. Although I don’t know her…in some ways I feel like I do through her girls and through her daily photo entries. Sometimes it is like looking at someone and really seeing them. My husband and I are both going to try our own hand at customizing and I am looking forward to meeting Melly and other Blythe owners at BlytheCon 2011. As for owning a Blythe girl customized by Melly….it will be a joy and a privilige! My favourite thing about Blythe is the fact that you can customize them to give them more personality and character. I love to make clothes and other things for them, and I`ve noticed how I make them all almost a mini version of me in one way or another. My fav. thing about Blythe is that every single Blythe has her own unique personality. Even if you have two of the same doll they can still be totally different! My favorite thing about Blythe is her ethereal beauty. I could look at my dolls all day. Wow, what a give away! I’m unfamiliar with Melly Kay’s work but I adore her eyelids and eyelashes, and Bellatrix Gamma Ray is a stunning doll! My favorite thing about Blythe is the way she comes to life in pictures and how she changed doll collecting for me forever. My introduction to Blythe came through the book Blythe Style. I was blown away by her pictures and how she came to life in them. The fact that someone took pics of a doll meant they played with her. This was very exciting to me. I had been an avid doll collector for almost 10 years at that point and had a mass of dolls that I loved but never touched. Blythe would change everything about doll collecting for me. I would never again buy a doll merely to put her on a shelf. From this point on dolls became hands on to me. She made me want to do things I never thought about doing before. Photography, sewing, customizing, Art and connecting with other collectors are what she brings to me. This doll that came to life in pictures brought life to me. She’s a joy to have and I can’t imagine not having her around. My favorite thing about Blythe is seeing the amazing photos people come up with – especially when they involve customs or restored dollies. I have always been fascinated with miniatures and doll houses, so when I come across a photo that is just an amazing, perfect little scene, I adore it. I love that they are a great conversation starter, and that there is an entire world of diminutive fashion out there – my dollies are better dresses than I am by far! The thing I love most about Blythe is how she has given me a bit of art back into my life. I have a creative outlet again now that I am not longer in theater and get to use that creativity in my photos which frequently are little stories. Plus my husband thinks it is awesome that I have turned them into little characters in our family. @thebrasscupcake J. Zumpf-Valosen- twittered as well! I love Melly Kay so much! I don’t have a Blythe yet but I would love one so I could dress her up and do photo shoots. I especially love that you can customize Blythe. My favorite thing about Blythe is not only is she beautiful but she comes with a beautiful community of people who I wish I was related to! I love designing and knitting for her and playing with her. I would totally be honored to win a Melly Kay custom as this would be my first custom:) Thank you for having this incredible giveaway. My favorite thing about Blythe is that you can create the most wonderful characters and have fabulous dolls by your side again just like when we were kids! Oh my gosh. I want to win this SOOOOOOOO much. I have wanted a Blythe for probably 3 months or so. I have loved her dolls and wanted one but didn’t have the cash. My favorite thing about Blythe’s is probably they are so cute!! what’s your favourite thing about Blythe? She brings out the little girl in me! When I think of Christmas as a child, getting a new doll and the excitement of finding her there under the tree on Christmas morning….that’s how she makes me feel! 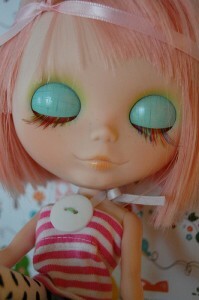 My favorite thing about Blythe herself is her changing eyes! It’s the one thing about her that remains constant, no matter how customized she gets. I love to embroider, sew, and sculpt, so for me, the best part of the Blythe experience is designing her wardrobe and accessories. I also love Blythe photography – each girl is so beautifully whimsical and wonderful. My favorite thing about Blythe is the fact that my mom thinks they are pretty cool. She’s in her 80’s. She’s especially fond of one who’s hair reminds her of how she used to wear it when she was younger. Here’s my twitter http://twitter.com/#!/AgentOwen and I’ve tweeted too! I love Melly Kay and her work and would be so honored to win Bellatrix and call her mine. 🙂 I promise to be a good mommy if I am deemed so lucky. 🙂 Good luck to everyone! My favorite thing about Blythe? The awesome things that super creative people come up with when they’re customizing her. My favourite thing about Blythe is all the lovely people who collect them ! My favorite thing about Blythe is how she really brings a wide range of people together. I have made so many awesome friends through Blythe who have helped me through some really difficult times of my life. Also that they bring out people’s creative side. Never thought I would do this, way in my 40’s!!!! I love Melly Kay’s creations! Ms. Bellatrix Gamma Ray is gorgeous and such a creative custom! I love Melly Kay’s custom work! My favorite thing about Blythe is how many different aspects there are to the hobby/culture; photography, collecting, customizing, doll houses, clothing/fashion…etc. I also love taking Blythe into public and seeing people’s reactions! My favourite thing about Blythe is …She is a mute mini person that still manages to speak volumes. My favourite thing about Blythe is her ability to have such a personality… for a piece of plastic! Each girl really speaks in a different way. She is a beautiful custom! I posted your amazing giveaway on my blog too…thanks again! first off,what countries are allowed to enter this giveaway?? Oh Melly Kay! She is gorgeous! I’ve posted a your photos and link on my blog! I’ve just gotten into Blythe and I’m hoping to customize at least one of them! I’m off to look at your flickr photos! I love me some Melly Kay! Her work is amazing and original. With that said, my favorite thing about Blythe is the friendships and connections I have made by simply enjoying this wonderful hobby. I also love how each individual girl has their own personality that shows through snapshots. My favorite thing about Blythe is the wonderful community that surrounds her! Fabulous interview! I loved learning more about Melly Kay! My favorite thing about Blythe is how she inspires me to be more creative and to connect with other people through art, humor, beauty, photography…you name it! I love how each Blythe has their own little (or big in some cases) personality. What a great interview, I love Melly’s customs. My favorite thing about blythe is her sweet, quirky retroness. My favorite thing about Blythe is that I can dress her the way I would dress if I weren’t so old! My favorite thing about Blythe is how unique they can be. They can start off being the same,but once they are dressed or fixed up,they become totally different dolls. She is the creative souls muse. Blythe just has a certain charm that other dolls don’t and they also have the best doll community in terms of sweet, helpful and very creative peeps. I own and collect a wide variety of dolls from bjds to play line dolls and no other community is like this one. My favorite thing about Blythe is how versatile she is. Melly’s customs are lovely! I’m a new collector, but so far I just love how different each girl is, and I love sewing clothes for them! 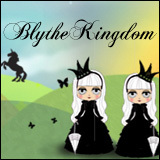 My favorite thing about Blythe is the creativity that surrounds her: fashion, photography, customization, art, etc! my favorite thing about blythe is just about ANYTHING mel does with them! she’s found her calling! I saw Miss. Gamma Ray and knew I HAD to enter, her eyes are uh-mazing! My favourite thing about Blythes? That they all look like they have a life of their own. I wish Toy Story included a central Blythe character just so we could see Pixar’s take on what her personality would be like, hahaha. Oh, gosh, Bellatrix is so gorgeous! My favorite thing about Blythe is the community around it. Purchasing a doll gives you entry into this wonderful web of people that are so supportive and creative. My favourite thing about blythe is that every doll has her own personality and becomes completely unique – Especially with customization. Bellatrix is gorgeous. Love those lids. My favorite thing about Blythe (after reading about it here), is that each doll has their own identity because the owners use a lot of creativity. Everyone could have a barbie, but they all look exactly the same. With these, none look alike (as shown in the pictures above). My favorite thing about Blythe is that they’re so customizable and unique! My favorite thing about Blythe is how they bring people together. I’ve made so many great friends because of these little plastic girls and I can’t thank them enough! Oops! My blogpost is http://milk-tooth.com/2010/11/12/inspirations-and-updates/ here! http://twitter.com/#!/PetSugarShop/status/4402683842666496 tweeted! i tweeted so hard with all fingers crossed! I absolutely love your blog and find nearly all of your post’s to be exactly what I’m looking for. Does one offer guest writers to write content to suit your needs? I wouldn’t mind composing a post or elaborating on many of the subjects you write related to here. Again, awesome web site!